April 13, 2019 – Arkansas LSAMP Spring Research Conference. The LSAMP scholars of UA Little Rock joined together with other LSAMP students across the state for the annual research conference. This conference brings together established minority students, faculty and professionals to guide/advise current STEM students as they navigate through their disciplines. The conference is designed to support and encourage student research and includes a graduate school fair for information regarding graduate programs. Students Kristen Gregory, Olgaaurora Rodriguez, & Paloma Salazar gave poster presentations and Evan Hicks gave an invited oral presentation. Paloma and Olgaaurora won first and second place, respectively, for their posters. 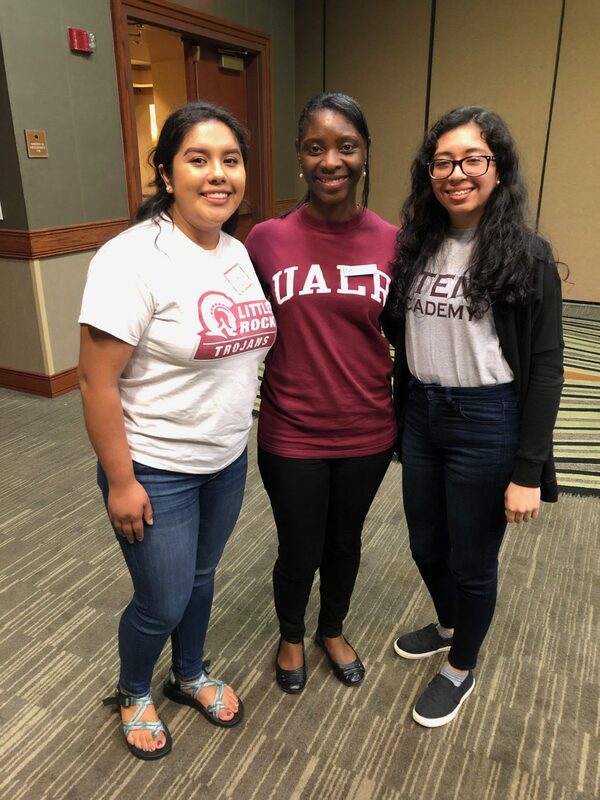 Paloma Salazar (left) and Olgaaurora Rodriguez (right) standing with LSAMP Director, Dr. Lakeshia Legette Jones (center). Paloma and Olgaaurora won first and second place poster in STEM. 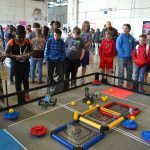 Results from the UA Little Rock VEX Robotics tournament held January 19, 2019 are in! A big thanks to all our dedicated volunteers who set up on Friday, worked all day Saturday, and tore down on Saturday night!!!!! You guys ROCK. To our referees, scoring staff, field setters, and concessions stand volunteers ~ we couldn’t have done it without you! And finally, to the ATU STEM Institute under the direction of Sarah Burnett … you are the heart & soul of VEX Robotics in Arkansas. 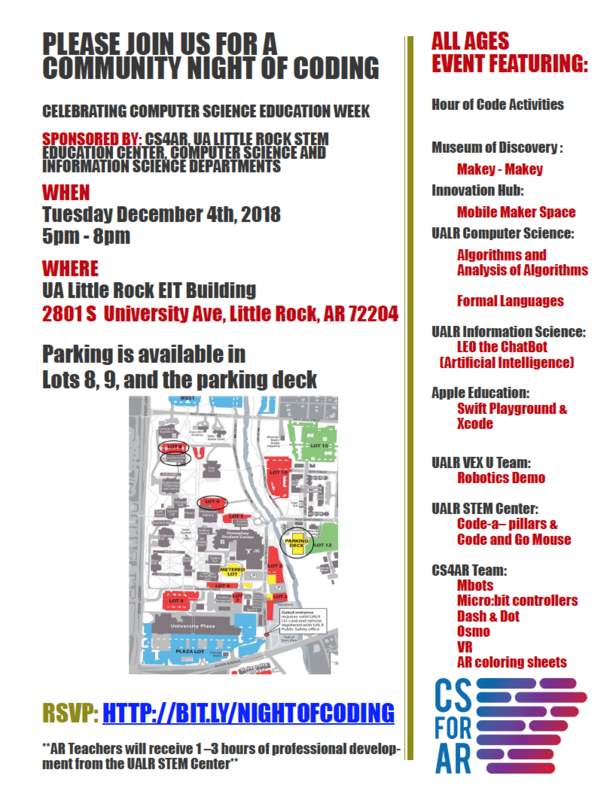 We hope to see you at our Community Night of Coding on December 4th in the EIT Building on UA Little Rock campus from 5-8 pm! We’ve just about nailed down our dates and camps for Summer 2019… so keep an eye out! But until then, take a look at the crazy fun we had Summer 2018! 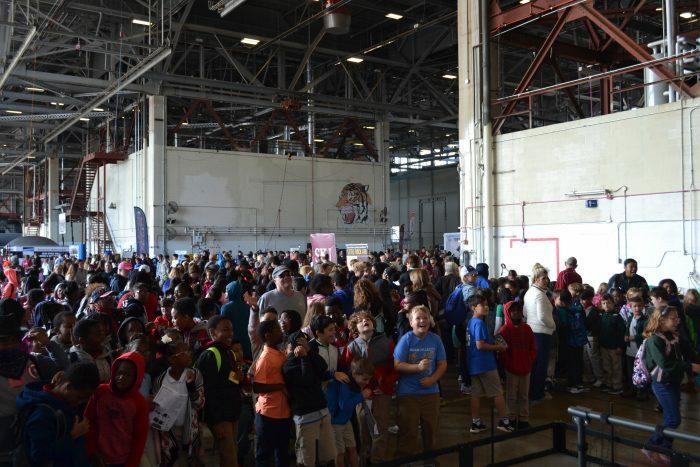 What do you get when mix 14,000 students, six VEX EDR fields and bots, six VEXIQ fields and bots and our very own Little Rock Air Force Base? THUNDER Over the ROCK. 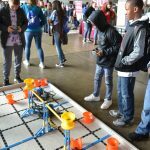 October 26, 27, & 28, ATU, UA Little Rock, and HSU STEM Centers teamed together to give students experiences with VEX EDR and VEXIQ bots. 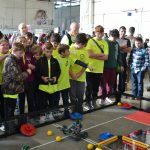 Fields were set up for both of the types of bots, hundreds of batteries were charged, and literally ~ 100s of students operated our VEX bots across all three days. What does 14,000 students look like? Below are our EDR and IQ fields… when things lightened up a bit…. throughout the three days. 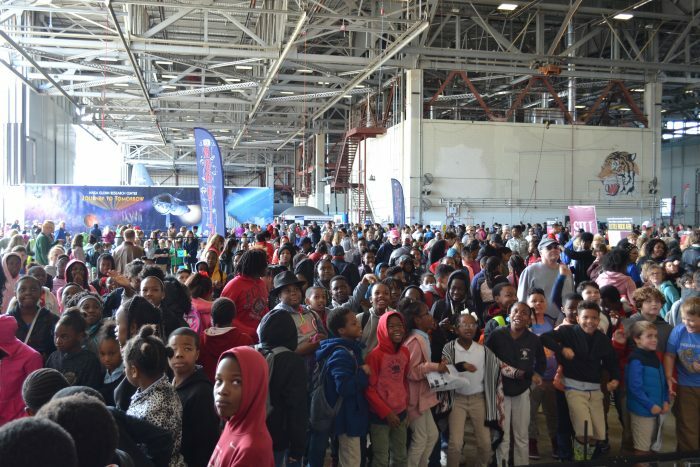 Three cheers to our incredible Little Rock Air Force Base and their generosity for promoting STEM education! 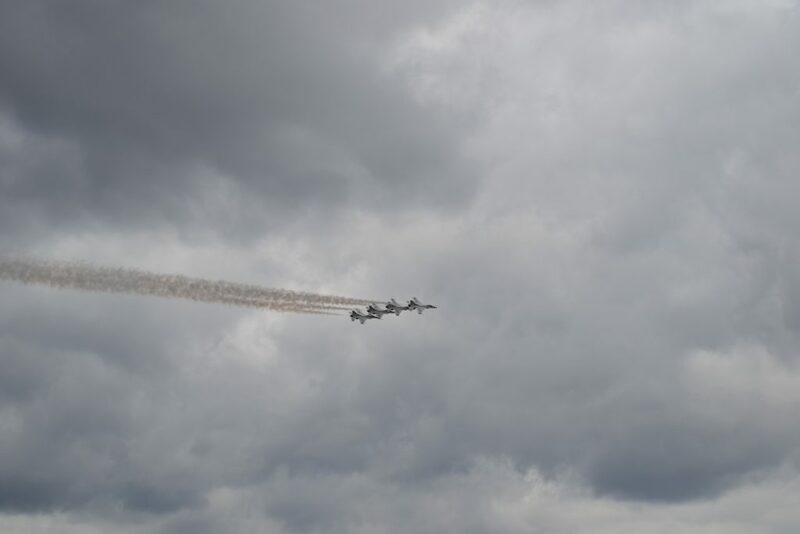 And not to be forgotten ~ an incredible air show by the Thunderbirds. October 11, 2018 was International Day of the Girl. The STEM Education Center teamed up with the Arkansas Regional Innovation Hub under the leadership of Sandra Leiterman, ADE Math Specialist and Errin Stanger, Deputy Director, to celebrate with over 50 junior high girls from ten difference schools in attendance at the first-ever Day of the Girl event in Little Rock. 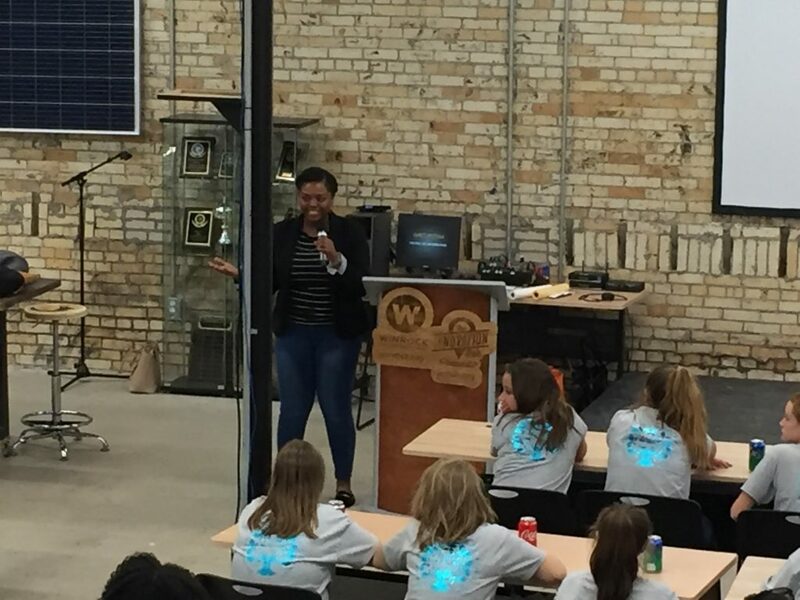 Keynote speaker, Joslyn Mitchell, an engineer at the Arkansas Department of Transportation, opened the event with her inspirational message about girls and STEM careers. Below (left), Jane Hurley, a chemist for Central Arkansas Water, worked with girls on chemistry and water quality issues. Quinyatta Mumford (center), an epidemiologist at the Arkansas Department of Health, explored how diseases are detected, controlled and eradicated. 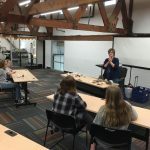 Camille Gernhart (right) with the Arkansas Geological Society engaged students in the intriguing aspects of gems and minerals common to Arkansas. Above (left), Olivia Kolenc and Ishita Tandon, UA Fayetteville biomedical engineering graduate students, made microscopes out of their smart phones. 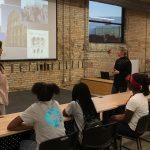 Heejung Choi (center), an anesthesiologist from UAMS took girls on an adventure into the world of anesthesiology while the love and creativity aspects of architectural design was explored by Sarah Bennings (right) of Polk Stanley & Wilcox Architects. 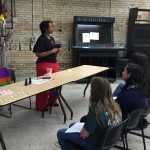 After the workshops, the evening ended with a panel discussion adding two more STEM professionals, Kera Lathen, a project engineer with Nabholz Construction and Tina Moore, Mathematics Program Manager for the Arkansas Department of Education. Plans for next year are already underway, so mark your calendars for October 11th ~ International Day of the Girl. So ~ you think you can text and drive ~ safely? 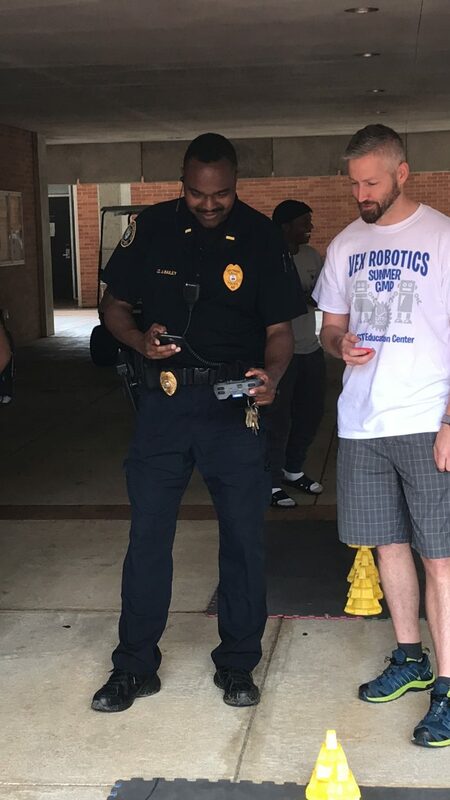 The STEM Education Center in collaboration with UA Little Rock’s Counseling Services (raising awareness about Maslow’s five Hierarchy of Needs) at the the first annual Self-Care Fair assisted students, faculty, and staff in seeing just how safe their driving was while texting at the same time. Using our VEXIQ bots, participants were given two chances to drive the VEXIQ bot through our treacherous obstacle course full of students (actually yellow cones) while texting and not texting. Of course, the data were conclusive: texting while driving is not safe. Below are Lt. Bailey with Public Safety and Dr. Baillie, Assistant Professor of Chemistry and Director of the STRIVE Program. For each student (yellow cone) hit, participants had one additional second added to their time. Thanks to everyone that participated! UA Little Rock VEX Robotics Camps Broadcasted by THV11 ~ Twice in July! 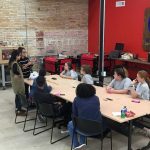 Under the leadership of Sandra Leiterman, ADE Math Specialist, the STEM Education Center hosted 6 VEX camps this summer in ETAS on the UA Little Rock campus. 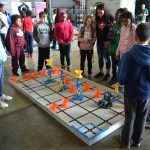 Along with camp director, Gene Williams and a number of talented college and high school VEX robotists, the six camps served over 100 beginners and experienced elementary/middle school students with VEX IQ and middle school/high school students with VEX EDR. In addition, 15 classroom teachers from the central Arkansas area joined the camps to learn more about how to create successful VEX robotics programs at their elementary and middle schools. Check us out on THV11 by clicking HERE and HERE! Intel International Science & Engineering Fair Winners from Central Arkansas!!! Received one of two Intel Foundation Young Scientist Awards of US$50,000 for her novel, low-cost approach for synthesizing materials that could greatly cut the production and energy costs of making electrodes for devices like supercapacitors. She found that combining common substances like tea and molasses with nitrogen and phosphorus in a commercial microwave formed a powder that could be used as a coating for electrode-like materials, giving them similar properties of more expensive metals like platinum. Won a comprehensive, full-ride scholarship, combining a monetary award and an environment focusing on knowledge, learning and research to Arizona State University. The New American University Intel ISEF Scholarship is renewable for four years. CARSEF Senior Division Overall Finalists ~ Going to Pittsburgh, PA! Hot off the press from Keith Harris, ADE Science Specialist ~ The following students were selected as Senior Division Overall Finalist which earns them a trip to Intel ISEF in Pittsburgh, PA this week (May 13-18, 2018). Good luck and make Arkansas proud! 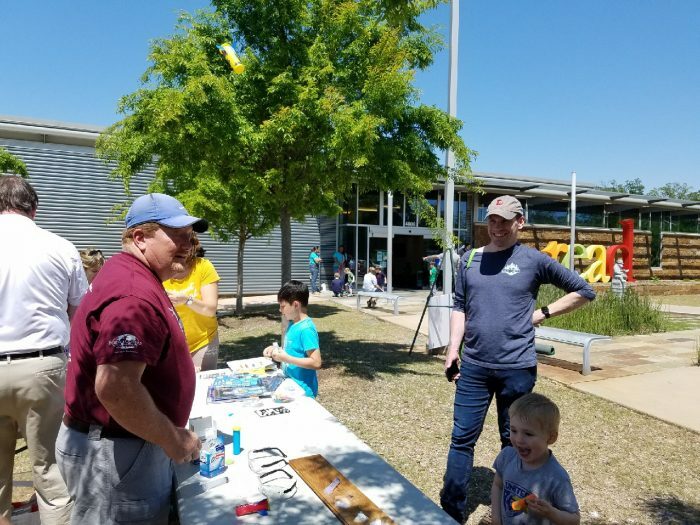 On Saturday, May 8th, the STEM Education Center joined with the Junior League’s Little Readers Rock to teach students and parents about Newton’s 3rd Law of Motion. Students were trying to determine, will more water or less water produce a higher blasting rocket? Rockets consisted of M&M plastic candy containers adorned with stickers and fins. For explosives to propel the ROCKet, we relied on Alka-Seltzer tablets and a little (2-3 mls) or a lot (8-9 mls) of water along with a quick shake. After nearly a 100 ROCKets and students ~ the data was analyzed and…. we learned that just a little water consistently produced the highest launch. Why? Water is heavy. More water also reduces the amount of space in which the pressure has room to expand. And, less water is less heavy and creates more space for the pressure to expand, thus creating the greatest force. Ahhh.. but when the force goes down blowing off the cap, a force in the opposite direction actually propels the ROCKet upward in the opposite direction ~ Newton’s 3rd Law of motion. Thanks to our student volunteers & soon-to-be Trojans ~ Will and Gavin for joining in on our fun and learning and to Keith Harris and Sandra Leiterman for their creative idea for our rockets! Note the YELLOW ROCKet in the right picture above and the ORANGE ROCKet in the picture below. On April 30th, UA Little Rock hosted its annual Student Advocate Awards reception in the Donaghy Student Center. Among those faculty and staff recognized was Dr. Jim Winter for his work and dedication to the STRIVE Program. The STRIVE Program, funded by the Arkansas legislature, is a long-standing STEM education program designed to place middle school, junior high, and high school STEM teachers in “real world” projects to promote problem-solving instructional approaches. UA Little Rock STEM Education Center Airs on THV Channel 11! To promote the Junior League’s Little Readers Rock and the Arkansas Literary Festival Partnership the STEM Education Center joined JL’s treasurer, Jennifer Goss, to explore Newton’s 3rd law of motion! Armed with junior rockets, water, and Alka-Seltzer tablets our unique rockets were launched with much anticipation. Click HERE to see our exciting news clip and be sure to watch all the way to the end of the segment for the final surprise! See you on Saturday! Click HERE if you need a refresher on Newton’s Laws of Motion ~ thanks to NASA. 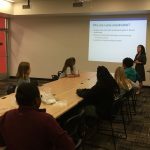 On April 13th, the STEM Education Center hosted it’s fifth Girls STEM Leadership Conference on the campus of UA Little Rock. Roughly 90 girls from Mabelvale Middle School (LRSD), Pulaski Academy, Quest Academy, eStem Junior High, and Episcopal Collegiate enjoyed three STEM sessions, lunch, and panel discussion to end the conference. Based on surveys completed by the girls and comments from their teachers ~ the day was a fun and successful! 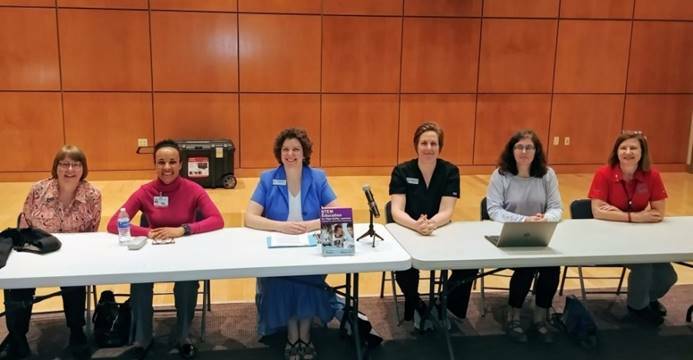 Below are the panelists that discussed STEM futures issues with the girls representing STEM fields in bioinformatics, data and information quality, nursing, chemistry and hydrology, gifted and talented STEM education, and geomorphology and sedimentology. Left to right: Elizabeth Pierce, PhD [UA Little Rock], Marcio Bryant-Howe, PhD [UAMS], Browyn MacFarlane, PhD [UA Little Rock], Joanna Rostad-Hall, BSN, RN [UA Little Rock], Beth McMillan, PhD [UA Little Rock], and Jane Hurley, PhD [Central Arkansas Water]. Interested in your girls participating in our Girls STEM Leadership Conferences? 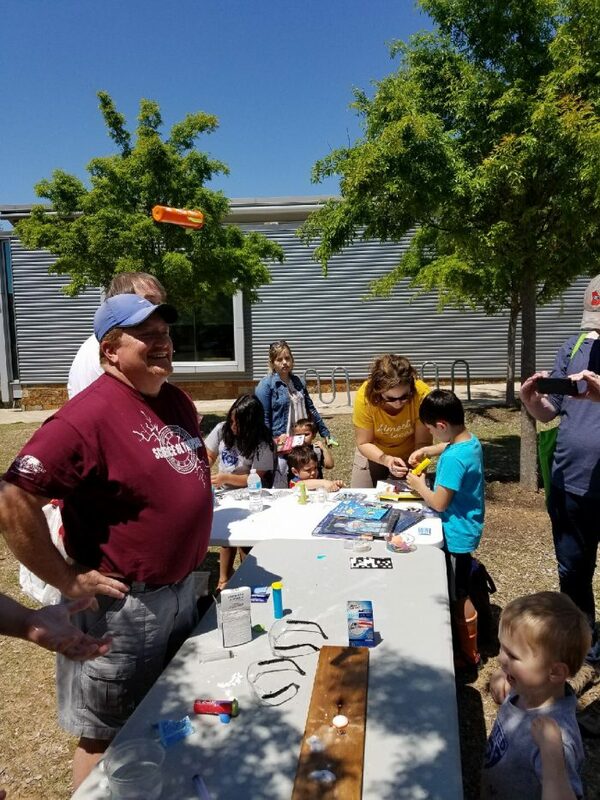 Contact Kent Layton, for more information about next year’s plans and best dates for your school as we plan to identify schools and dates Summer 2018 so that plans for next year can take our conferences and the girls’ STEM experiences to the next level! 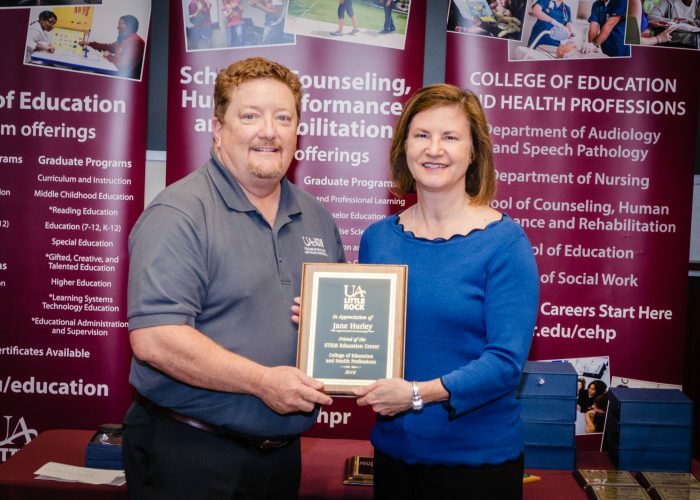 Each year, the STEM Education Center recognizes one individual and/or agency outside of UA Little Rock that has made a significant contribution to our unit at the annual College of Education and Health Profession’s Award Ceremony. This year’s recipient is Jane Hurley, Education and Outreach Specialist at Central Arkansas Water. Since our brainstorming work on the Power of Water NCLB Grant began in Winter 2016, Jane Hurley has been the “lighthouse” of our collaborative efforts working tirelessly to design an institute for teachers that would be exciting, yet meaningful; rigorous, yet presented at a level that teachers could transfer and align their new knowledge in the classroom; and comprehensive, but not overwhelming. 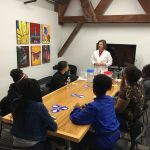 During out time together, Jane ~ a chemist by trade ~ has proven to be an amazingly innovative professional with value-driven insight and incredible passion for STEM in the K-12 environment, whether in a lab or in the watershed. 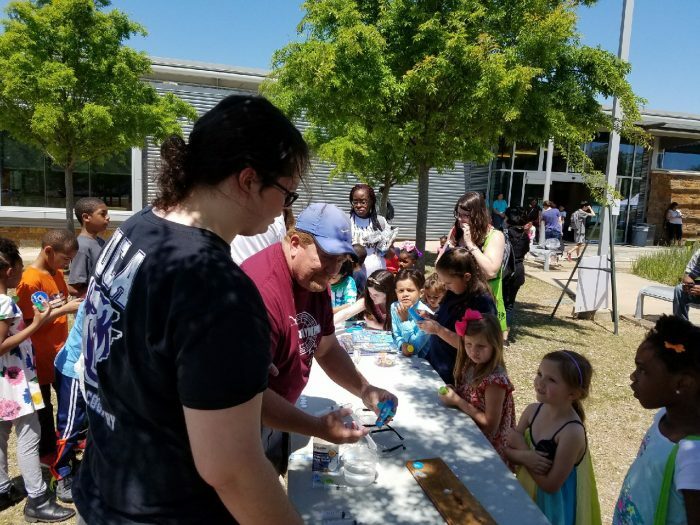 In less than a year at her new position as Education and Outreach Specialist at Central Arkansas Water, she has blazed the trail to become highly informed about K-12 STEM in the region and the state as well as connecting Central Arkansas Water’s outreach efforts to schools throughout central Arkansas. Even more impressive ~ before we could wrap up the first Power of Water Institute funded by a NCLB STEM Grant in December, Jane shared Central Arkansas Water’s interest in continuing to support central Arkansas teachers with an ongoing Power of Water Institute each summer in collaboration with the STEM Education Center ~ which we have planned for Summer 2018 and just recently opened registration. We simply can’t fathom a more dedicated and high-performing individual for this award than Jane Hurley. From the bottom of our hearts and on behalf of the students and teachers in central Arkansas, the STEM Education Center, and the College of Education and Health Professions, thank you for all that you do for STEM education, our schools, and our communities. Are you interested in a Science, Technology, Engineering, Mathematics, (STEM) degree? Teachers - Do you or your school need some Resource Materials for your STEM classes? Check them out here! !